Henry de Bracton (d.1286), perhaps from Bratton, near Westbury in Wiltshire, was a senior judge in the middle of the 13th century. His 'Laws and Customs of England' was a philosophical treatise, laying out principles of English Common Law: it includes, for example, the maxim that 'the king is under the law because the law makes him king', which was used against the monarch during the Civil War. It continued to be a fundamental text for five centuries. Law books were usually functional rather than luxury objects, but this example is neatly written and has fine decoration; it has an inscription recording that it belonged to the abbot of Chertsey in 1530. 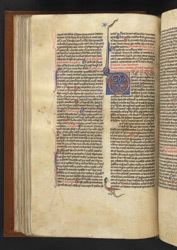 The large initial marks the end of Book II and start of Book III of the text. Half-way down the right-hand column the scribe has left a space to avoid writing over a natural flaw in the parchment.